"If you think that dogs are just ugly brutes, you will have about as much success as a surly misanthrope would have if he tried to photograph children—dogs know." Monday I introduced you to a rather elegant man and his Irish Red Setter. Today we read the advice of Photographer George Oliver as to how to photograph dogs. I've included more of my collection of dog photographs. Don't dog owners look like their dogs? In certain sporting or training districts the photographing of animals should prove as important an adjunct to the business as does the photographing of students in some college towns. For a long time I have made quite a specialty of dogs, being rather fortunately situated in a district where there are not only many bird dogs, but where, in addition, many lady summer visitors bring their pet dogs. The work divides itself into three classes: first, the photographing of sitters, accompanied by their pet dogs ; second, the photographing of the dogs alone in the studio or in the garden attached to it ; and last, the work in the open field. In studio work of the first class I find ladies the easiest to take, but the hardest to please. 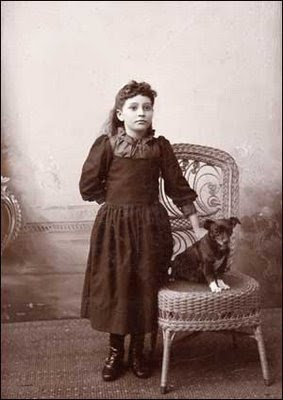 A lady, more often than not, has a small dog which she is fond of holding on her knee, or even in her arms. 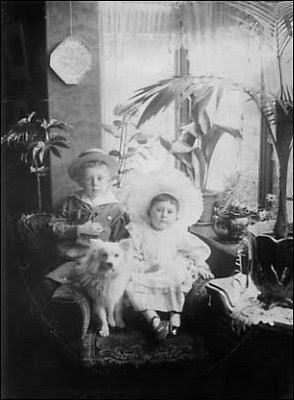 She is usually taken sitting, and the dog, being quite at home in its position, will, before many minutes are past remain quiet sufficiently long for an exposure. A noiseless shutter works inside the camera, and I use all the light there is, with a big aperture and rapid plates, so that the exposure is reduced to a fraction of a second. A pet dog will sit up more or less alertly on a word from its mistress or from the photographer, and photographs in which both face the camera, the one smiling and the other alert, seem to be the most popular. With difficult dogs much patience is necessary, but I can always get them, sooner or later, while their mistresses are talking to them. These are the pictures which more often please the friends of the sitter than the sitter herself, and they lead to a number of resittings. But I, a few years ago, adopted the rule of giving re-sittings without a special charge, and, taking one customer with another, I think the work pays well on this plan. With men I usually let them stand, with the dog at one side, and this is not easy work, for the dog is nearer the edge than the centre of the plate, and it often means more than a little work before the dog can be got in sharp focus and remain there long enough for an exposure. Right here let me say that it is no use trying to photograph dogs unless you were born a friend of them. If you think that dogs are just ugly brutes, you will have about as much success as a surly misanthrope would have if he tried to photograph children—dogs know. With a love for dogs you have the right qualification, but a knowledge of dogs is also necessary, so that "points," etc., may be intelligently and even enthusiastically talked about. The reason I succeed with difficult dogs is, I think, because it never occurs to me that I am "exercising patience," or living up to any other school-room maxim; I am simply interested in the effort. For photographing dogs without their owners I have in the studio a tall table, three feet six inches high, the top of which has been thickly coated with warm glue and then sprinkled with coarse sand. A board, similarly coated, hangs in front to hide the legs of the table. A plain screen, either lighter or darker as best suits the dog is hung behind. The dog stands on this table. If the dog wears a collar or is used to the leash I let his master hold him, but remove the chain or strap and use instead a piece of very flexible, dull, copper wire. If this shows at all it is only slightly, and can easily be spotted out. The owner may stand behind the background, looking over it, and, of course, well above the top of the picture. More often the holding should be done by some third person, the owner meantime talking to the dog. When the dog is in position the owner, telling it to stand still, walks slowly out of the range of the camera. If the dog does not watch him sufficiently alertly, the necessary expression of interest will be got by breaking a bit of bread or a biscuit. I focus as soon as the dog is in position, draw the slide, and hold the bulb in my hand ready to press. I always make the exposure the moment the dog looks as I want him. Some plates show movement, but I do not lose as many as when I first commenced and used to hesitate, wondering if the dog were going to move. And sacrifice anything you like for speed, as long as exposure isn't sacrificed. There must be a sufficient exposure. The work which I do in the garden is the same, except that I have a grass-covered bank built about seven feet high, with a broad step half-way. The dog stands on this, and the bank forms a sort of continuous background. The last method is taking dogs out with their masters. I first tried this with a quail dog, and so pleased its owner that he sent me several other customers. I use a reflex camera, and where I have the right sort of owner to help me can get some good pictures of dogs at work. At first I used a 5 x 7 Kodak, and do not think I have beaten it much, and certainly have not beaten the films which I used in it. About the money end of the business: During the summer months I must have averaged three or four sitters a week, either dogs or dogs with their owners. The takings have averaged about $7 per customer, and I calculate three-quarters of it would not have come to me had it not been for the dogs—their owners would not have come on their own account. I do not think that I can reckon much cash asset, after paying expenses, out of "field work." I like the work and take it on, as I am so fixed that I need not be in the studio every day. If it meant losing money at home it would not pay me at all to go out-of-doors. I keep rather more than half my window full of dog pictures. One or two only would do no good, but with a full show people see that it is a special line with me. I have never been able to trace a cent that I have lost through anyone objecting to a studio in which dogs are frequent visitors. Oliver, George. "Photographing Dogs. Wilson's Photographic Magazine. New York : E.L. Wilson. 1913. Girl and Dog. Relf. Neligh, Neb. Cabinet Card. Unknown. Privately held by the footnoteMaven, Preston, WA. 2009. Boy and Dog. Marr & Co. Norwich, England. 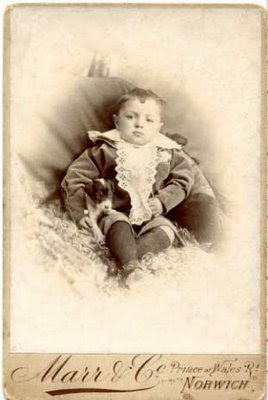 Cabinet Card. Unknown. Privately held by the footnoteMaven, Preston, WA. 2009. Girl, Boy, and Dog. Anonymous. Print. Unknown. Privately held by the footnoteMaven, Preston, WA. 2009. Good Morning, wanted to let you know that I have presented you with the 2009 Friendly Blogger Award. So stop by www.whereicomefrom2.blogspot.com and claim your award. HAve a great week. I nominated your site for the "Friendly Blogger" award on AncestorTracking...the pictures and information you share are truly an inspiration!